Shakespeare? Othello? OMG, no way! 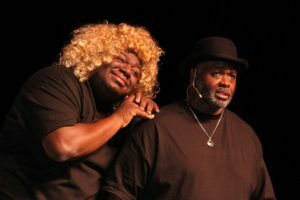 But…say, “Yes” to “Othello the Remix” now playing at the GEM Theatre in the Jazz District, presented by The Black Repertory Theatre of Kansas City. the overall story remains in tact–well, sort of. 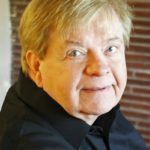 Producing Artistic Director and BRKC founder, Damron Russel Armstrong said that he wants to create challenging works that allow local African-American actors to portray characters and perform plays that might not feature them. 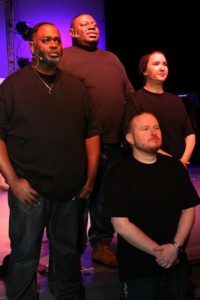 “Othello the Remix” certainly brings something new to the KC audiences. For this show Armstrong cast four male actors, two black and two white actors. About three weeks into rehearsals one actor broke his foot and could not continue. 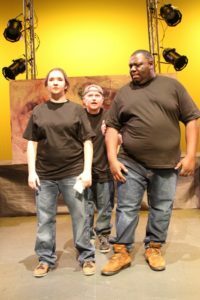 And, “The show must go on.” So, stage manager Megan Greenlee stepped into the role and must perform with script in hand to get through the fast-talking rhythmic/rhyming play. With only four actors, they must change characters on the fly, grab wigs and feather boas and whatever else to differentiate characters and scenes. Fun, evil, poison, plots, treachery, and lots of laughs tell an updated and convoluted story of the Shakespeare classic. The Shakespeare characters appear in this production, but with some slight changes to their names. Othello, Desdemona, Bianca, Iago (Lago), Rodrigo, Cassio, Emelia, and other characters rap and romp through this farcical look at one of Shakespeare’s kings. The rhythm and rhyme in “Othello the Remix” rings true and on beat. The rhyme scheme just flows with the new words and movement. The story, simplified a lot, still conveys the story of the original classic. Students who shy away from Shakespeare will know and understand this story without effort. 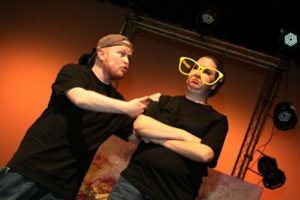 Fun and fantastic, “Othello the Remix” beings a fresh approach to Shakespeare and strips the difficult story to a simple story told through Hip-Hop music. The cast–all of them–tease the audience throughout as they deliver their rhyme. To see Shakespeare in new light, go see this show. The Bard will never be as cool and approachable as in this production. The actors perform magic as they recite the new words in rap format to keep the story moving. The character switching is fun and allows the actors the opportunity to create over-the-top lampoons on a classic tale. The cast is: Douglass Walker as Othello, Adam Golden Gripp as Lago/Brabantio, De’Markcus Howell as Emilia/Cassio, Megan Greenlee as Rodrigo/Bianca/Loco Vito. (Greenlee stepped in after Austin Schreck’s injury.) 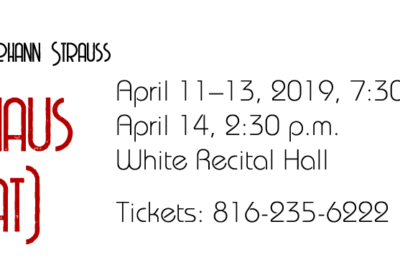 The production team is: Damron Russel Armstrong, director; Megan Greenlee, stage manager; David Kiehl and Chris Holbrook, sound; Tim Sella, lights; Christopher Barksdale-Burns, choreographer; Annette Armstrong, box office. 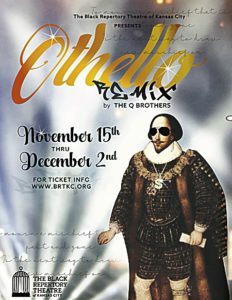 “Othello the Remix” runs Nov. 15-Dec. 2. Because of impending holidays, check the BRKC website for specific dates, times, and ticket purchases. 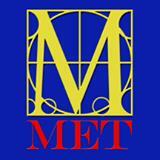 Student matinees begin at 10a.m. on Nov. 23. 29, 30. Group tickets also available through the website. The play continues as the GEM Theater, 1615 E. 18th Street, Kansas City, Missouri, 64108.